Here stood the bridge of Revolutionary fame where 1000 Patriot’s under Cols Richard Caswell and Alexander Lillington defeated 1600 loyalists led by Captain McLeod. Col James Moore commanded all the Patriots who embodied to oppose the loyalists under Brig. Gen. Donald McDonald. Location. 34° 27.54′ N, 78° 6.462′ W. Marker is in Currie, North Carolina, in Pender County. Marker is on Borough Road (State Highway 210), on the right when traveling south. Touch for map. Marker is in this post office area: Currie NC 28435, United States of America. Touch for directions. Other nearby markers. 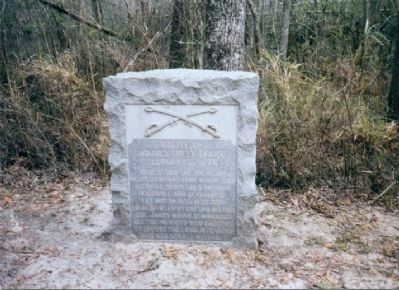 At least 7 other markers are within 16 miles of this marker, measured as the crow flies. Cornwallis (approx. 10.8 miles away); Burgaw Station (approx. 12 miles away); Our Heroes (approx. 12.1 miles away); S. S. Satchwell (approx. 12.2 miles away); Stag Park (approx. 12.6 miles away); George Burrington (approx. 12.6 miles away); Hinton James (approx. 15.4 miles away). 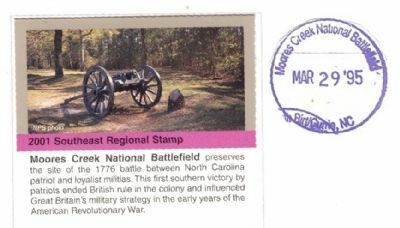 National Park Passport Cancellation Stamp-Moores Creek National Battlefield preserves the site of the 1776 battle between North Carolina patriot an loyalist militias. This southern victory by patriots ended British rule in the colony and influenced Great Britain’s military strategy in the early years of the American Revolutionary War. More. 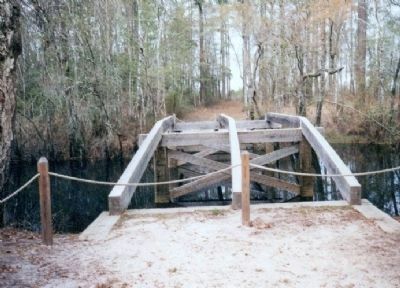 Search the internet for Battle of Moores Creek Bridge. Credits. This page was last revised on June 16, 2016. This page originally submitted on January 10, 2013, by Don Morfe of Baltimore, Maryland. This page has been viewed 367 times since then and 13 times this year. Photos: 1, 2, 3. submitted on January 10, 2013, by Don Morfe of Baltimore, Maryland. • Craig Swain was the editor who published this page.